Jen at PatternsbyJen (here) has posted another great block for the colour challenge. The floral inspiration for the April block is a bulb called Glory of the Snow. With the amount of non stop snow some of us have seen this past winter glory may not be the word we would use but the flower is pretty. My photo is a little blurry but I think you get the idea. When I made my block I think I went a little on the dark side. Jen has all the directions on her blog. this and all the other blocks she is presenting for the colour challenge are basic blocks that she has written good clear directions for you to make them. 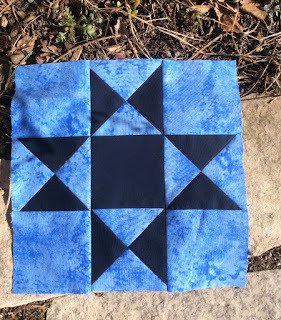 Remember to stop by the other bloggers who are showing off their blocks this month. Ooh, I like it! I think going to the "dark side" made your block really dynamic! Looks great. Time to search the stash for some fabric. I love the contrast between your blues :) Your block is beautiful! Have You Seen Alison Glass' Trinket Sew Along?